Search-startpage.com is deemed as computer threat. It falls under the category of Adware that sneaks into the computer and installed as browser extension. Like most adware, Search-startpage.com may enter the computer through software bundles. This is a method where several applications, including adware are packed into one installation file. They are installed simultaneously on the computer unknown to user. Once installed properly, this adware interacts with browser like Chrome, Internet Explorer, or Firefox to add an extension. Although, the added code is specific to home page and default search engine, there are instances that it will override new tab and other parts of the browser. The level of infections caused by Search-startpage.com may vary depending on browser programs and its version. Most recent browser versions are likely to be less vulnerable to Search-startpage.com attack. So, it is important to update your internet software to the most recent version. Start-up page diverted to Search-startpage.com is a clear sign that adware is controlling the browser. Furthermore, each time you run an online search, adware will always impose the use of this questionable search engine. The main reason for employing such conflict is to generate online profit through issuance of advertisements. You will notice that both sections may contain paid advertising links. Moreover, search page may redirect browser to unsolicited web sites that also earns revenue via traffic referral scheme. To safely search the web, there are couples of legitimate and secured search engine that you may use. Avoid unknown and detested one like Search-startpage.com. If you are one of those who wanted to get rid of this browser hijacker, then, you can find the quick removal guide below. Be sure to scan the computer with efficient anti-malware tool as suggested. This rootkit and virus removal tool is free and easy to use. 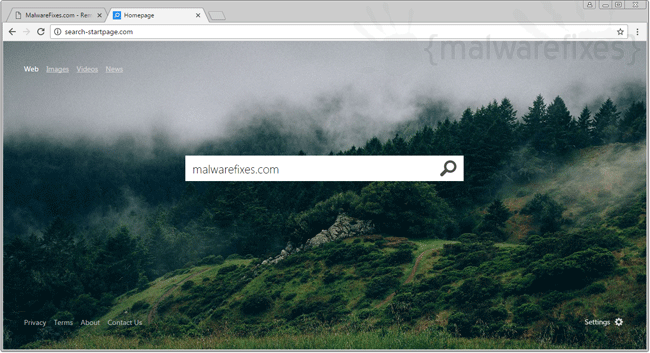 It scans, detects and removes any rootkit, malware as well as threat like Search-startpage.com home page hijacker. The tool is powerful enough to find malicious items that are hidden on the computer. 7. Click on Start Scanning button to begin checking the system for presence of rootkit and virus. The tool reveals items that were found linked to Search-startpage.com. It also detects and removes other malicious files. 4. It searches for presence of harmful programs, plug-ins, add-ons, or any data that were found malicious and linked to Search-startpage.com. You need to Clean all items detected by this tool. After the previous scans, you may have deleted Search-startpage.com from the affected browser. This next step will ensure that no more module of adware will be left on the browser. This free tool scans and checks the browser for unwanted add-on and extension, and if found, Avast Browser Cleanup will give you a report and suggestion. 4. Avast Browser Cleanup will confirm before it permanently deletes the add-on. Please click Yes to proceed with the removal of Search-startpage.com on the affected browser. Cleaning your internet browser from clutter and unwanted add-on/extension is a must when dealing with Search-startpage.com. The procedure below discuss on resetting various browsers to its default state. This function will reset your home page, new tab page, search engine, and other areas affected by Search-startpage.com. Unwanted extensions will also be removed from the browser. This will not affect your bookmarks, history, and other saved data. You may also run Chrome Cleanup function from this page. An integrated tool from Google Chrome but with more advanced Adware scanner feature. Your data like favorites, bookmark, and history will remain it the browser. However, this process may delete add-ons by Search-startpage.com and other unknown objects. If you prefer to carry out the procedure manually, please view instructions here. This section describes how to remove unwanted extension from Firefox that may be related to Search-startpage.com. This process can fix many browser issues by restoring Firefox to factory settings without affecting your essential information (bookmarks, browsing history, passwords, and Internet cookies) on the browser. If you desire to remove only specific extension, please see manual add-on removal from this link. 4. Firefox browser will close and start the resetting process. When done, it will display a list of restored data. Search-startpage.com home page hijacker should be gone by now. Click Finish to open a fresh version of Firefox.